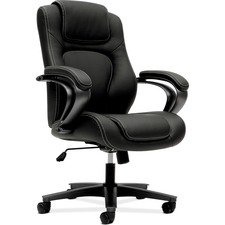 Executive high-back chair features a generously proportioned seat and back cushions that are welcoming to every body. Segmented, padded back design with contrasting top stitch offers an upscale look for any executive office or conference environment. Swivel/tilt allows the chair to recline effortlessly, promoting movement and comfort throughout the day.